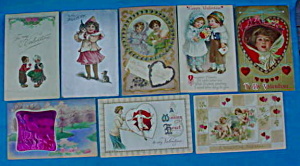 Collection of early Valentine Postcards. 13 different Cards. The range from 1908 to about the late 20's. All have been postally used. Light corner wear but overall very good condition. Great to add to your Vintage Valentine collection. Buyer to pay shipping.